I was fully ready to indulge in some serious dimsum and other Cantonese chow, armed with recommendations from an employee of the City of Vancouver. I am disappointed to report that I didn't have great Chinese food or any great food in Vancouver, but it's less a reflection on the quality of the restaurants than it is the restrictions and finicky tastes my travel mates had. and a sausage roll that could have come from a box. You can't miss those delicate little tea sandwiches, of course. 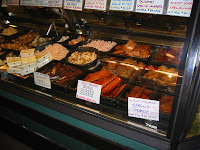 We had smoked salmon with maple Dijon cream cheese, egg salad and watercress (standard), mango-curry chicken salad with toasted cashews (my personal favorite), smoked ham with sweet grainy mustard (blah) and cucumber with fresh ginger (could hardly taste the ginger) cream cheese. Top it off with sweets like chocolate Grand Marnier truffle (too sweet for me), orange apricot loaf, chocolate brandy Napoleon slice, shortbread cookie, a fresh fruit tart (which was bad, bad, bad), candied ginger scone (rock-hard) and a traditional black currant scone with strawberry jam and whipped Devon-style cream. You may be wondering why I bothered to review this place if I didn't think much of its food. Two words: the view. I mean, how can you go wrong with such a killer view? This confirms my theory that all restaurants with a great view don't have good food. I usually avoid these like the plague but it's hard to pass up such a nice ambience and view from your window. 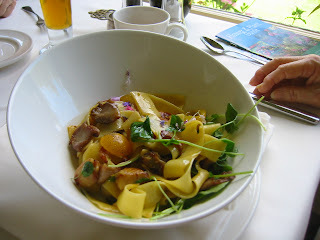 I should also add that the pasta one of my companions ordered from the lunch menu was superb. It was pappardelle pasta with grilled oyster mushrooms, pine nuts, roasted garlic, cherry tomatoes and watercress in an olive oil sauce. Service was good but a tad slow, like in most fancy restaurants. 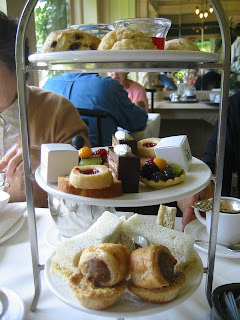 Another reason to come here is that afternoon tea is a treat and seems to be the thing to do to experience the Commonwealth-ness of this country (and you get to nibble on a variety of things). Yes, as pretty as the flowers were, the Gardens felt like Disneyland, so I appreciated a moment of peace from the throngs of tourists. Although the dining room was full of tourists like myself, it felt more mellow. Here are a few restaurants to avoid: Seoul House Royal Korean Restaurant on Broadway near the airport unless you're absolutely desperate for Korean (don't ask why we went); Fish House in Stanley Park, which had great salt cod fritters but the day's special of three types of salmon was dry and the salmon didn't even taste very fresh. And it was very expensive. 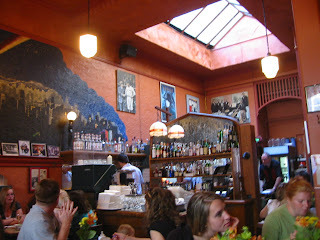 In Victoria, we went to Pagliacci's, which seems to be immensely popular with locals and tourists alike. It's a charming Italian place (right) with very warm service. Unfortunately, the food didn't quite measure up. 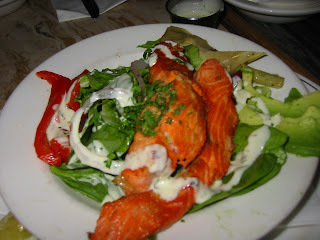 We had smoked salmon salad with avocado, roasted red peppers, artichokes and greens, which was good, but when it came to the pastas, it flopped. My massive lasagna smelled like it had mixed ground beef with spicy Italian sausage, which I dislike, so couldn't eat it. I really wanted to like it, but the food didn't deliver. If you decide to go, however, make sure you get there at 5:30 p.m. sharp for dinner, as lines form even before the restaurant opens and only get longer as the evening progresses into peak dinner time. I was amazed at how nice and efficient the wait staff managed to be at Pagliacci's. Despite the chaos of people lining up outside, tons of hungry eaters asking for things, our waitress never failed to check in on us and respond to our multiple requests for water, more bread, etc., with a friendly, "for sure," or "certainly." I quickly realized that Canadians say "that's for sure" a lot. Not sure what it is but Canadians were generally a lot nicer than people in any other English-speaking tourist hot-spot I've been to. Is it the water? Besides sampling good Chinese food in Vancouver, one thing I wish I had done is eat at Granville Island's market, which boasts myriad of food stalls and fresh fruits and vegetables. 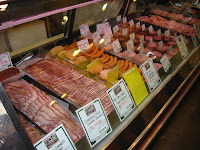 Check out the varieties of Canadian bacon and salmon displayed below. Sheer pleasure. 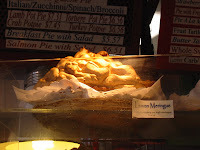 In case you can't tell, that is a real lemon meringue pie. Tell me about your fave Vancouver spots. 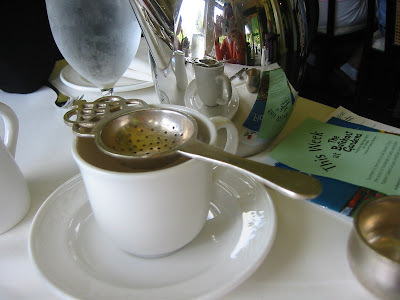 Finally, a plug for Pacific Palisades Hotel, which was conveniently located on Robson Street, close to shops and restaurants, and mostly importantly for us, a Japanese market that had good green tea and red bean pancakes. My only complaint about the hotel is that it charges $25 a day for parking in its garage. 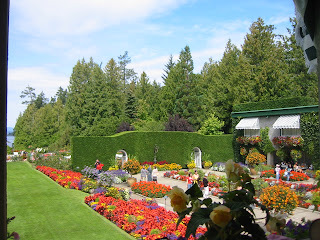 The Buchart Gardens are really beautiful, worth making a trip to from Vancouver. I disagree with the reviewer about Pagliacci Italian restaurant. Thought it had good atmosphere, great service, and decent food. A real find in the touristy portion of Victoria, BC. With beautiful trees, mountains and water, modern buildings, and such cloyingly friendly people, who needs good food? i like the cultural commentary on the canucks. in minnesota, in addition to "fer sure," they also say "oh sure, you betcha" with a norwegian accent. or so i hear! i think i lost my minnesota passport long ago.